Producing 4 4-inch by 3.84-inch pieces per sheet, this perforated card stock configuration is fantastic for printing gift cards, certificates, tickets, VIP passes, and tax forms. Each letter-sized (8.5-inch by 11-inch) sheet is perfed in 2 columns and 2 rows, with 1.38-inch bottom and top margins, as well as 0.25-inch side margins. Pick from several different paper colors and card stocks. Micro-perforation between each segment for a clean tear. 1.38" margins on the top and bottom, 0.25" margins on the right and left. 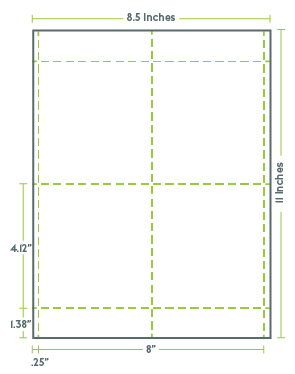 Shop PerforatedPaper.com to find the perforation layout perfect for your project.